By adding more scenes to your tour, you can create new views of your data that focus on specific geographic locations or time periods. 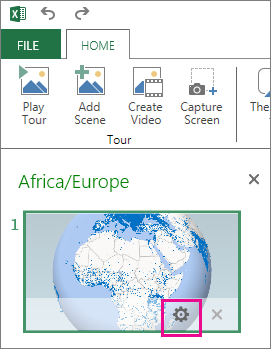 When you add a new scene to a tour, it’s not empty—it’s based on the currently selected scene in the Tour Editor pane. After you make your changes to the new scene, you can move it wherever you want in the tour. To add a new scene, in the Power Map window, click Home > Add Scene. The new scene appears directly below the selected scene in the Tour Editor pane, showing a scene thumbnail on the left. You can access the scene options by clicking the Settings icon that shows up when you hover over the thumbnail. Change the length of the scene's play time. Change the length of the transition time from the previous scene. Add an effect to the scene, such as a flyover, zoom (push in), or globe rotation. Make an effect more dramatic by increasing its magnitude. Speed up or slow down an effect. If you have multiple scenes, you can change their order by moving them around. Just drag a scene to another location in the Tour Editor pane.